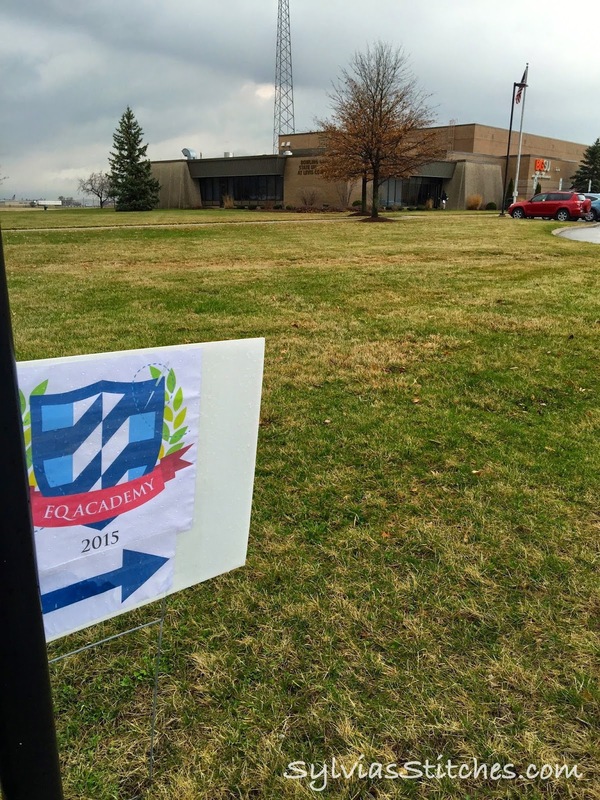 Today wrapped up Electric Quilt's first EQ Academy training seminar held in Perrysburg, Ohio. There were two sessions for EQ7 and one sessions for EQStitch. Each session included 3-days of hands-on instruction. So much fun!! I attended the EQ Stitch session which was taught by educator Yvonne Menear. Yvonne had prepared over 170+ pages for our handout. Lots of information to cover in 3 days. Topics covered in our EQ Stitch class included learning the tools of the Stitchings work table, the many ways a task may be done in EQ, looking at our work with a critical eye to refine it for the best results, creating your own appliqué, using photos with your stitchings, and even designing stitchings for simple in-the-hoop projects. The Electric Quilt company provided boxed lunches for us each day, along with light snacks and drinks during the day. Last evening, we were treated to a catered dinner and short lectures from each of three EQ Academy educators: Yvonne, Mary Ellen Kranz and Barb Vlack. The lectures were fun and informative. Nice door prizes were given away as well. A bit of excitement was had this week in Perrysburg as bad weather came through on Thursday. 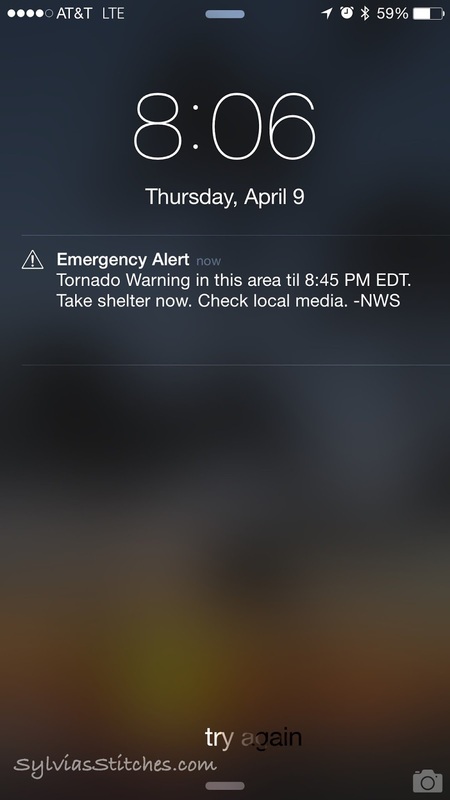 The sky was not looking good, and an alert popped up on my phone indicating a tornado warning for the area with advice to seek shelter. Well, that is something I haven't seen before. 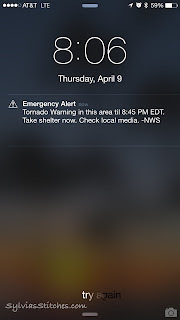 I had never seen an alert like that before, nor have I ever been in an area where tornados occur. As I was wondering if it should be taken seriously, the hotel alarm sounded for everyone to evacuate to the cement stairwells to wait out the storm. Tornados had been spotted in our area, but thankfully the storm passed our hotel area without incident. We stepped outside as the rain and hail subsided to watch the storm clouds roll away. The calm behind the storm. Our class was a lot of fun. Definitely learned a lot and would recommend this to others who really want to get the most out of their EQ software program. EQ Academy's charter EQ Stitch class. Yvonne was a great instructor with in-depth knowledge on how to get the most out of EQ Stitch. She has published an EQ Stitch book for the company as is currently teaching EQ Stitch classes online at EQ University. I have taken her intro to EQ Stitch class online already. I also have her book - but have to admit that I have not read it yet - it is on my To-Do List! Definitely would recommend her classes to others. So glad to have you come to our first Academy! Great Post!! I really enjoyed the EQ Stitch class also!! Sylvia, You lucky girl! I would love to have been able to attend EQ acadamy. Funny thing is, I grew up just outside of Perrysburg, so am very familiar with the area, as well as the tornado warnings. My mom and other family members are still in the area. Maybe one day I could combine a family visit with a future EQ acadamy. I am glad that you found it to be a great event to attend.